When I was in junior high school I read Ray Bradbury’s The Martian Chronicles. It made a very strong impression on me. I immediately began reading everything I could find by Bradbury. I was surprised to discover that most of his writings were neither science fiction nor fantasy, even though his books were always located in the science fiction section in bookstores. (This was back when bookstores were a fairly common sight, before Barnes & Noble and Amazon pretty much killed off the book retail business.) I dutifully read each one, however, hoping to find something that would affect me the way The Martian Chronicles did, but that never happened. What’s more, it seemed to me that his writings became increasingly sentimental as he got older, so I eventually stopped reading them. 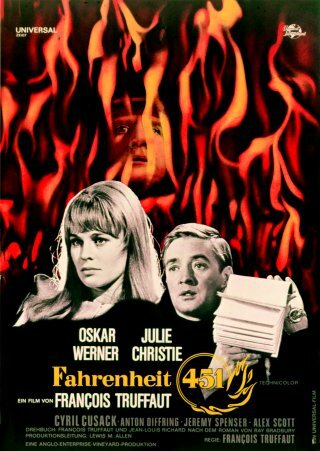 Fahrenheit 451 is Bradbury’s most famous book, even though it is not his best, and it is even atypical of his work, since it is his only dystopian fantasy. It is set in a future in which the government burns books and most people spend their free time watching gigantic television screens. When I heard about Bradbury’s recent death at the age of 91, I decided to watch Truffaut’s 1966 film adaptation of Fahrenheit 451. Truffaut’s film is not as bleak as Bradbury’s novel (the latter ends with society being destroyed by nuclear war), but it suffers from the same basic problem that the book does: it is a political story without any politics in it. Guy Montag (Oskar Werner) works as a “fireman”, which is actually a policeman who finds and destroys books. The government has passed a law outlawing all books, regardless of their content. Montag is married to Linda (Julie Christie), his stay-at-home wife who spends most of her time watching vapid TV shows. Montag’s captain (Cyril Cusack) thinks highly of him and recommends him for a promotion. One day, while taking the monorail home from work, he meets Clarice (also played by Julie Christie), whose free-spirited and inquisitive personality he finds oddly appealing. She seems to plant some seeds of doubt in his personality, for at a book burning he snatches a copy of David Copperfield and brings it home to read it. He begins bringing other books home and reading them as well. This causes tensions between him and Linda, who disapproves of reading. At a book burning at an old woman’s house, the woman (Bee Duffell) sets herself on fire along with her books. This incident leaves Montag feeling profoundly disturbed, which leads to a confrontation with Linds. She informs on him. Montag is forced to flee. Clarice has told him about a group of people living outside the city known as the “book people”. Montag goes to them. They are people determined to preserve the world’s books by memorizing them. Each person is required to memorize one book word for word and then destroy it. Why destroy the books? Because, we are told, so the police can’t destroy them. I have a serious problem with this. What real difference is there between them destroying the books or the firemen destroying them? And having people memorize books is an obviously impractical way of preserving them. Wouldn’t it make more sense to record the books on microfilm, or some other medium that can easily be hidden? For that matter, why does the government burn books? The captain tells Montag that it’s because books make people “anti-social” and “unhappy”, which isn’t really true, so what’s the real reason? We’re never told. In fact, we’re told almost nothing about the government itself. It’s clearly a police state, but we’re told nothing about its ideology. Some would argue that is the point: people are so busy watching TV that no one cares what the government is doing. And yet there are some people who still read books. The firemen seem very busy in this film. So why does the government regard these people as a threat, even if they read books that are not political at all? The book burnings in Fahrenheit 451 are clearly meant to remind us of the book burnings in Nazi Germany. The Nazis, however, burned only certain books, and they did so for reasons that were explicitly political. The lack of politics in the story is a serious weakness. George Orwell”s 1984 is compelling because of its political ideas, even though these ideas are flawed. By comparison, Fahrenheit 451 seems flat. Fahrenheit 451 is thought of as an anti-censorship novel, but it is actually an anti-television novel. Bradbury himself said as much. (Bradbury sometimes wrote for television, so his feelings about the medium were apparently mixed.) It depicts a world that has declared war on the printed word. Interestingly, Bradbury wrote Fahrenheit 451 in the early 1950’s, when many of the pulp magazines he wrote for in his youth were going out of business, largely because they couldn’t compete with the still relatively new medium of television. One suspects that there was an element of resentment fueling this novel. Six years after he wrote Fahrenheit 451, Bradbury wrote Dandelion Wine, a sentimental fictionalized account of his childhood in 1920’s Illinois. (A book that owes a lot to Thomas Wolfe, though it has none of Wolfe’s sharp social commentary in it.) 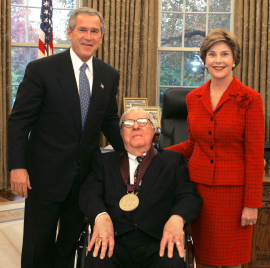 It perhaps shouldn’t be surprising then that Bradbury became a political reactionary in his later years, expressing admiration for Ronald Reagan and for George W. Bush. Considering this, it’s perhaps just as well then that there are no politics in Fahrenheit 451. Despite the weaknesses of its story, Truffaut’s film is nonetheless entertaining to watch. Truffaut greatly admired Hitchcock, and this film has a Hitchcockian look and feel to it: claustrophobic rooms and hallways, with a subtle and mounting feeling of dread. The book burning scenes are disturbing to watch, as they should be.